Stopping by with a quick post today to share this super easy jam recipe with you! If you know me (which I’m hoping you do by now), you know I’m chia obsessed. In particular, I love chia jam. It’s so easy to make, and so versatile. You can use so many different fruit combinations, and you can change-up the texture by adding as much or as little chia as you like. And if all that wasn’t great on its own, chia jam also helps add more iron, fibre and healthy fats to your breakfasts and snacks! 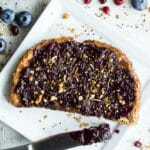 While I eat chia jam on the regular, I only have one other chia jam recipe on the blog, and it was the first recipe I ever shared on Crumb Top Baking. 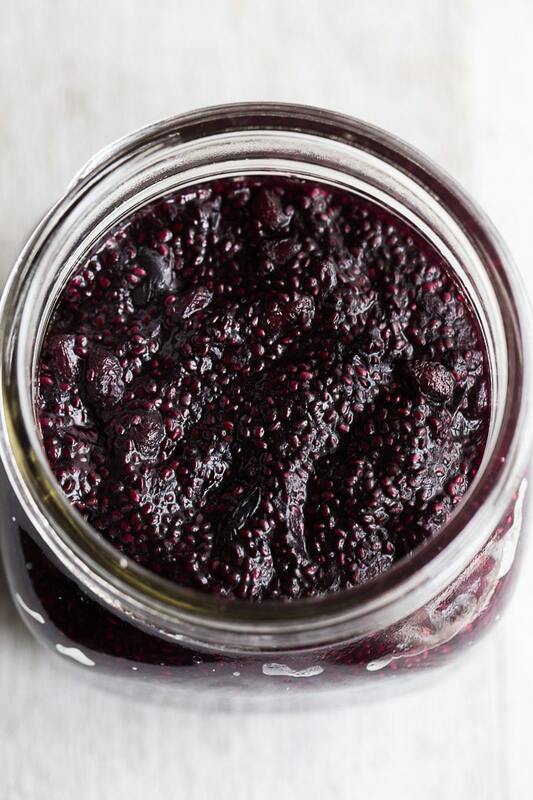 This Triple Berry Chia Jam has been my guide for many other jam recipes over the past few years. If you follow me on Instagram, you would have seen a blueberry version of this recipe not too long ago. 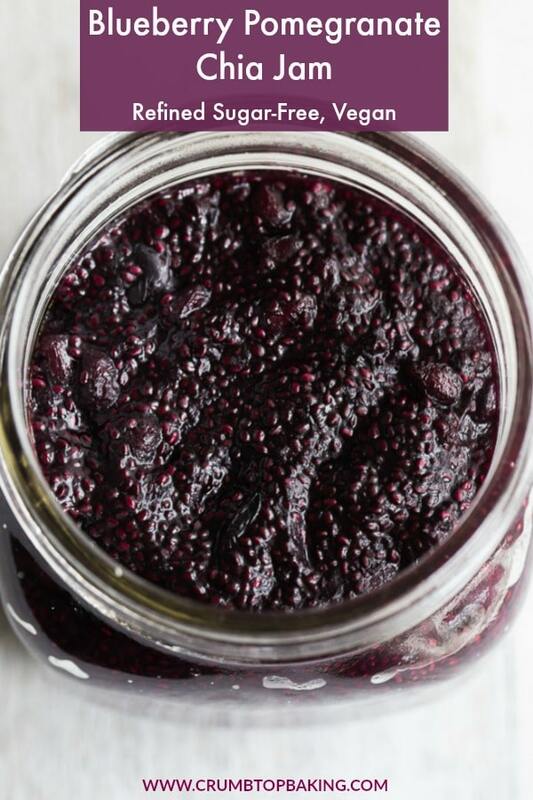 Today’s recipe for Blueberry Pomegranate Chia Jam is a play on my original recipe, except I added some lemon juice and zest, which pairs nicely with the blueberries. 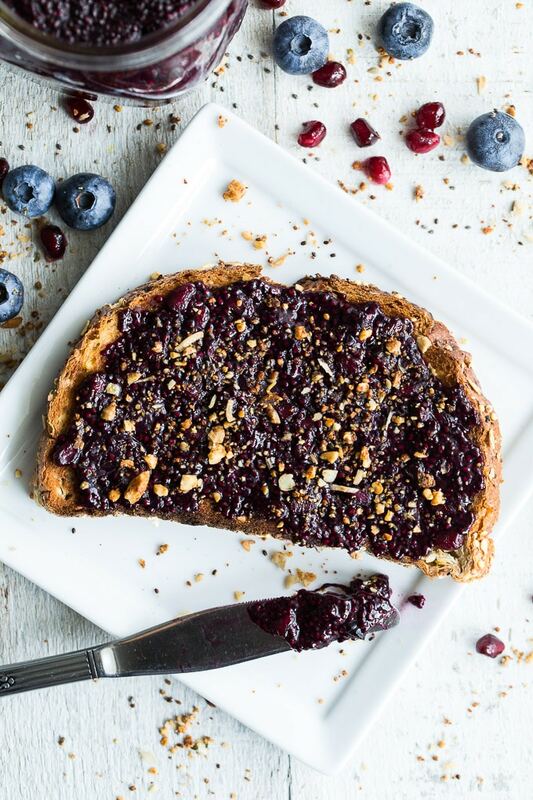 The pomegranate arils, along with the chia seeds, also add a nice seedy texture to this jam. If you’ve ever had bakeapple jam (or cloudberry jam), this jam has a similar texture. So stating the obvious, but toast is a great way to enjoy this jam. 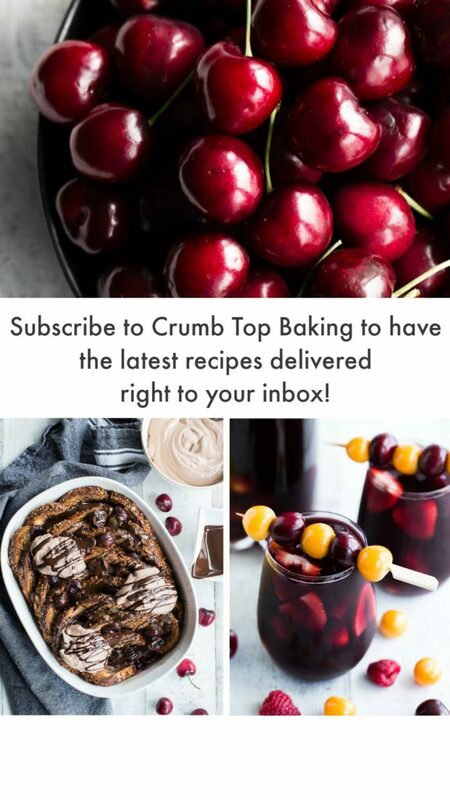 You can layer it on thick with a sprinkling of granola on top or a layer of nut butter underneath. 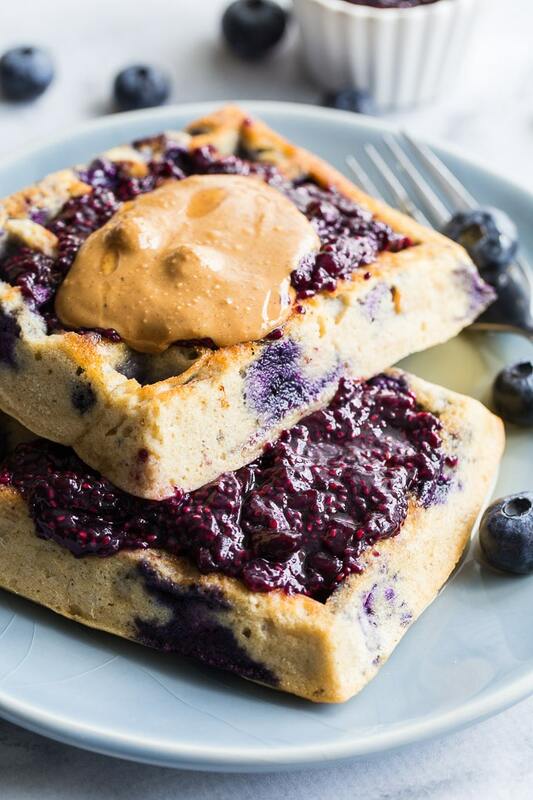 You can also use chia jam as a topping on your waffles or pancakes instead of syrup. A dollop of chia jam on top of smoothies or granola bowls adds a nice contrast of texture and flavour. Chia jam makes a great topping for chia puddings. It might seem like an excessive amount of chia, but if you’re a fan, there’s nothing wrong with a double dose of chia, right?! One of my all-time fave ways to use chia jam is as a filling for oat bars or cookie cups. However you plan to enjoy your chia jam, I hope you give this recipe a try! And be sure to let me know what you think in the comments below! Bring on the chia jam! 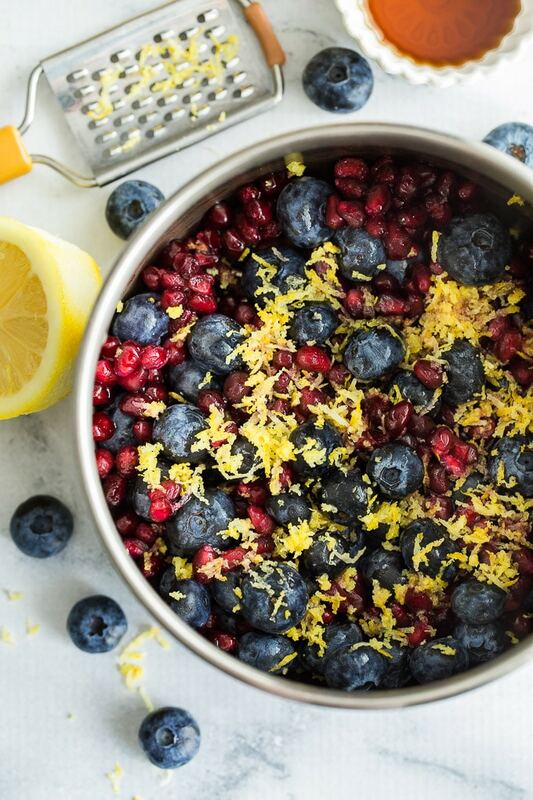 This would is jam packed with goodness from those blueberries and pomegranate. I could probably eat it straight up with a spoon…that would be ok, right 😉 ?? Always amazes me how chia thickens jam….like magic! Haha! Thanks Dawn! Chia is totally magic, and eating this with a spoon is perfectly acceptable! This jam is my kind of JAM! Hehehe. The flavors you have in here set this jam over the top! I would put this jam on EVERYTHING! Thanks Kelly! I’ve been putting this jam on waffles, pancakes and smoothie bowls, in addition to toast. So not quite everything, but quite a few things!! Love your love for chia jam Leanne! 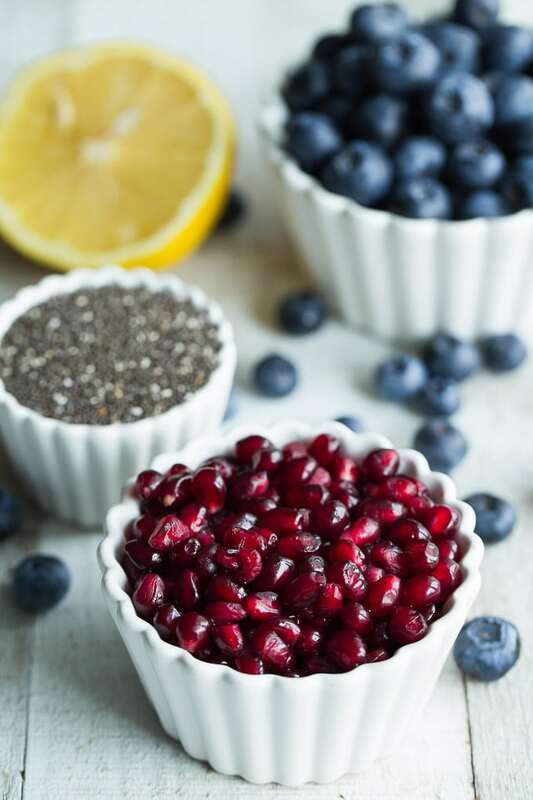 And this flavour combo is just lovely – my little guy loves pom seeds so I’ll be saving this to make! Thanks Tanya! My love for chia jam might be considered an obsession! 😉 I hope your little guy likes it! I absolutely love this Jam, and I’ve already said it over and over, but your pictures are phenomenal!! Thanks Camila! That’s so nice of you to say! Happy weekend! Love everything going on in this jam! Spread it on everything! Thanks Patrick! I would have to agree! I’m not sure if I’ve ever mentioned how much I adore chia jam. But I do! It’s my favorite to top toast, oatmeal, yogurt. . .to eat with a spoon too! And this one sounds extra special! I’m totally trying it because I’m still finding the most wonderful blueberries. Hope you’re having a great week, Leanne! I didn’t know that Kelsie, but I totally understand your adoration for chia jam! I would love to know what you think if you make this one! Hope you’re having the best weekend my friend! I love chia jam and this flavor combination sounds so delicious! I’d want to swirl this into my oatmeal every day or eat it by the spoonful! Thanks Marcie! Swirling this jam into oatmeal sounds like a great idea! I love making jam Leanne and this flavor sounds delicious! I’d be spreading this on lots of things! Thanks Mary Ann! I love making jam too….especially chia jam! Thanks Melissa! Adding this jam to a slice of vanilla pound cake sounds heavenly! Great idea! Thanks Terri! Glad you like it. I’m a big fan of chia jam! This recipe is perfect, I don’t often make homemade jam because canning takes some time. But I love homemade jam so this is the perfect compromise. Can’t wait to try it! Thanks Kristen! I don’t have the patience for canning jam, so small batch chia jam is the only jam I make. Hope you like it!